In addition to the PC and Mac, Slick Entertainment have announced that their upcoming procedurally generated beat-’em-up Viking Squad will also be coming to the PS4 in 2015. As everyone remembers from history class, polar bears wearing barrels were the viking’s sole natural predator. 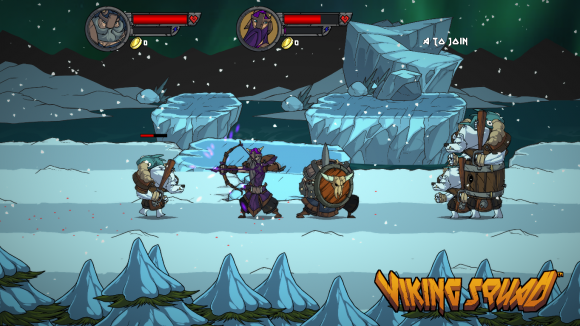 Viking Squad is a procedurally-generated side-scrolling beat-’em-up with role playing elements. Have you picked your jaw up off the floor yet? Good, then let’s continue. The beat-’em-up genre is not known for embracing such concepts as procedurally-generated levels or character progression, yet these are two elements Slick Entertainment hopes will make Viking Squad stand out from its competitors. Combined with the game’s crisp animated aesthetic and use of operational lanes rather than true free-roaming brawling and Viking Squad starts to sound very much like Guardian Heroes meets Rogue Legacy by way of Golden Axe, a combination that is sure to make any gamer drool. In addition to the PC and Mac releases that are pretty much expected of any Indie title worth its salt, Slick Entertainment announced via a blog entry on the 26th that they would also be bringing Viking Squad to the PS4, even going so far as to express interest in the comments in a potential future release to the Vita as well. For the moment, though, all mobile/handheld plans for the title are little more than speculation, with the team focusing all their efforts on simply bringing the PC/Mac/PS4 versions of the game to market. If Viking Squad sounds like the game for you, then sit back and relax for a while: the game has yet to announce an official release date or a price point. Nevertheless, it certainly looks like an intriguing release, and is one easily worth keeping up with future announcements on.